This numerology software known by the names like numerology calculator, Ankjyotish and Vedic numerology software which gives information about root number, auspicious/inauspicious (Shubhashubhjnanam), auspicious Mantra and name number. This software also gives prediction for birth date, name number, destiny number & root number. From this software you can get details like friendly number, enemy number, name number – Reduced name number & determination of auspicious and inauspicious name numbers on the basis of date of birth. Apart from Numerology calculations and predictions it also contains comprehensive and complete astrology solutions required by an astrologer for making predictions in its Astrology module i.e. planet aspect, Bhava aspect, cusp aspect, Saptvargas, Shodash Vargas, Varga Bhedas, Vimsopaka, Satvargas, Shodash Vargas, Varga Bhedas, Vimsopaka, Karaka, Avastha, Rashmi, Nakshatra Reading, Mahadasha and Antardasha analysis and Transit predictions for next 30 years, More than 500 astrological combinations, transits till 9999, the combinations and remedial measures for inauspicious Yogas like Manglik dosh, Kaalsarpa Yoga and Sadesati etc. have also been given in detail. Calculations of radical number, lucky number, name number & numerological life graph. From this software one can get information like nature, personality, auspiciousness/ inauspiciousness and future of the native on the basis of root number, destiny number and name number. Predictions about friendship and partnership, love and marriage, favourable colour, lucky vehicle number, occupation, favourable stones or substitute stones. 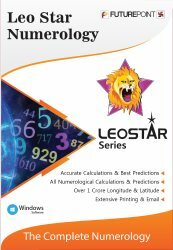 Leostar Numerology software contains the comprehensive knowledge of numerology. If reduced name number, destiny number and root number do not match then the methods of changing name have also been incorporated in this module. Details like friendly, enemy numbers and neutral numbers & auspicious/inauspicious information (Shubhashubhgyanam). Information like auspicious/inauspicious years and you can know whether a specific year shall be a special year for you or an ordinary one. Similarly, the auspicious days, dates months, gemstone, Upratna, favorable god, auspicious metal, color and mantra based on numbers will be useful and beneficial. Favourable/Unfavourable time, day, dates, months & years. Specific Yantras which should be worshipped are prescribed on the basis of root number, lucky number & destiny number. Grah Mantra, Grah Dhyan, Grah Mantra Jap, materials to donate, herbal bath etc are also prescribed on the basis of root number, lucky number & destiny number. Avakhada, Ghatchakra, Tara Chakra, Panchang, Calendar. The modules that one gets in Leostar Numerology software are Teva, Astrology, Numerology, Tables & Mundane.